It's the same old story every winter – I'm always looking for a simple, soothing moisturiser to stop my skin from dehydrating. 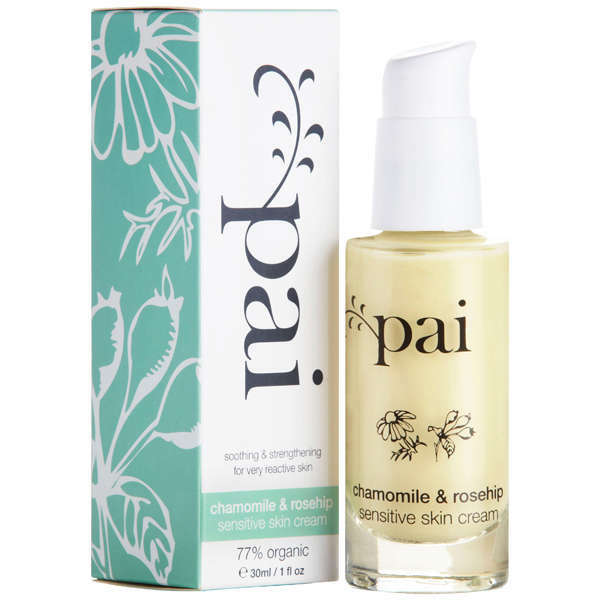 This year I've been using Pai Chamomile & Rosehip Sensitive Skin Cream to see if it's up to the job. Pai is a UK company with an ethos of transparency. They use only 'clean' ingredients and list every component in their formulas in plain English rather than chemical formulas designed to baffle us. All products are certified organic by the Soil Association. This moisturiser has a very mild, fresh scent that I'm struggling to describe – a bit like a refined Twinings herbal tea. Lovely, elegant and relaxing. The texture is that of a water-based cream. It's not oily but spreads easily across skin and sinks in beautifully. I'm prone to spots and dehydration and my skin can easily feel parched. This moisturiser packs a double punch with chamomile providing matricine and azulene; and rosehip – full of omegas and antioxidants. On days where my skin is doubly dry I layer over a facial oil or mix some with it. It leaves my skin ready for makeup and hasn't made me break out. The only thing I've not liked about it is the bottle. It's glass with a pump dispenser and I found it stopped working when the bottle was still half full. I've had to take the lid off and wiggle the tube around inside every time I use it. The bottle opening is too small for my finger so I'm left pining for the last few applications of product. I'd like a tube that's double the size. Pai Chamomile & Rosehip Sensitive Skin Cream is available at paiskincare.com. They often have good offers and it's free postage! Have you tried any Pai products yet? Pai is one of my favourite brands, I haven't brought the moisturiser in a while because the frustration with the packaging. Nice review - this is a quality skin care line. I try to keep using natural and organic skin care products to have beautiful skin with the best ingredients. I think that's the best way to maintain healthy skin as we age. Nice post.